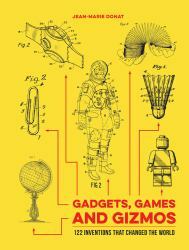 "Discover the designs behind some of the most amazing inventions ever imagined. This book contains the original drawings submitted to the patent office for such indispensable items as the paperclip, the ball-point pen and the umbrella, as well as technological marvels like the space suit, the floppy disk and the Polaroid camera - and not forgetting fun and frivolous things like the Barbie doll, the skateboard and the Game Boy. Expand your knowledge and inspire your inner inventor with this fully illustrated guide to the everyday gadgets, games and gizmos that changed the world!" --Publisher description.